With the change in seasons comes a change in game bundles for NVIDIA. 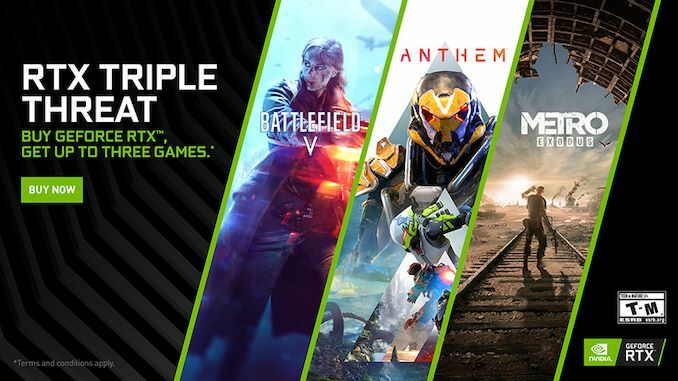 This morning the company announced that they’re launching a new GeForce RTX-focused bundle – the aptly named “RTX Triple Threat” bundle – which will see the company bundle a selection of Battlefield V, Anthem, and Metro Exodus with their RTX video cards. This latest bundle is currently scheduled to run through the start of April, or until NVIDIA updates it once more. NVIDIA’s latest bundle replaces the outgoing Game On bundle, which was comprised of Battlefield V and Anthem. Like the previous bundle, this latest offer is focused on including some of the flagship titles for NVIDIA’s RTX ray tracing and image upscaling technologies, as NVIDIA looks to put its best foot forward and try to entice gamers to invest in the tech by buying a GeForce RTX video card. In this respect the latest addition to the bundle, Metro Exodus, has been pretty widely acclaimed as the best example of RTX to date, thanks to its more extensive use of ray tracing for lighting and a DLSS implementation that is sharper than anything we’ve seen before. As with the past bundle, this latest bundle is essentially a two-tier setup. NVIDIA’s top-end GeForce RTX 2080 Ti and 2080 cards will come with all three games in tow. Meanwhile buyers of the RTX 2070 and RTX 2060 will get their choice of just one of these games. Note that, as is usually the case with NVIDIA, this offer also applies to most desktop and laptop systems including these cards as well. Meanwhile for the rest of NVIDIA’s product stack, the recently-launched GeForce GTX 1660 Ti remains the odd card out, as it does not have a bundle. Below it, NVIDIA’s remaining inventory of Pascal cards, from the GTX 1070 Ti down to the basic GTX 1050, all include NVIDIA’s Fortnite bundle. Finally, as always, codes must be redeemed via NVIDIA Redemption portal on a system with a qualifying graphics card installed. More information and details can be found in the terms and conditions. Be sure to verify the participation of any vendors purchased from, as NVIDIA will not give codes for purchases made from non-participating sellers. I was trying to redeem the code, and found that the promotion here in Thailand works a bit different than in the states. Looks like the promotion is not tied to the retailer, but to the card manufacturer. Also looks like the promotion here only applies for GPU card, laptops are not eligible (and I've just bought my laptop ... *sigh*). Anyway I've sent the some question to Asus and hopefully they will have some good news for me.